1 What is bursitis knee? Bursa is a sac like anatomical structure which is filled with fluid and act as a pad for reduction of friction between bones, muscles and tendon associated with any joints. 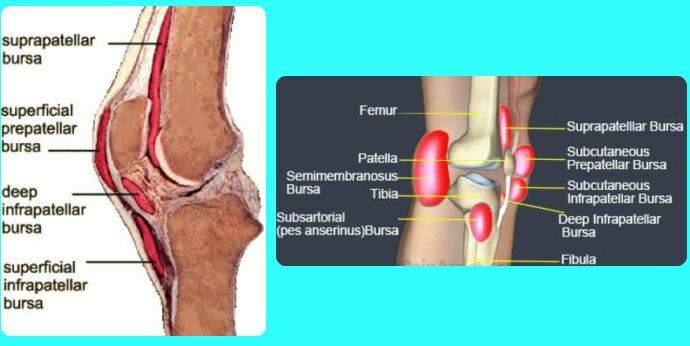 In knee, total 11 bursae are present and distribute though out the knee. 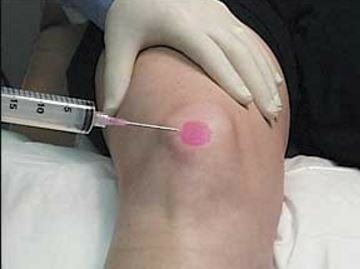 Bursitis knee occurs due to inflammation of the bursa present in the frontal zone of the knee. The specificity of this is localized inflammation, which shape is quite similar like lime or grapefruit. This lump like structure noticeable as this is formed just beneath the skin. In gout or arthritis whole knee joint become swelled and not localized only in the frontal zone. The pain symptom is milder, but repeated kneeling increase pain with stiffness of the joint. Occupational hazards which cause pressure generation at the kneecap due to repeated kneeling. Primarily plumbers, coal miners, carpet layers, roofers and gardeners are affected. Very strong direct force at the frontal zone of the knee also causes bursitis knee. Sports persons like footballers, wrestlers or basketball players often get direct hit on their knees and have a great risk of development of bursitis knee. Concurrent medical conditions, including gout, arthritis also increase the probability of bursitis knee. If the bacteria enters through open injury in the knee and reached to bursa sac and infect the fluid which also cause inflammation and pain in the knee joint. 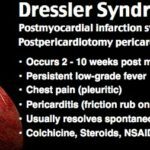 Initial diagnosis starts with discussion of symptoms and if the doctors found the symptoms are quite similar to bursitis knee and then he may ask the patient’s occupation along with past medical history. During this discussion doctors usually try to chalk out the possible reasons behind development of bursitis knee. After the discussion, physical examination of the affected knee, including mobility of the knee joint, stiffness, pain intensity in different stretched and relaxed condition are evaluated. According to patient’s symptoms and the doctor’s findings following possible diagnostic tests may he will order. X – Ray provides clear image of the patella (knee bone). This is conducted for the evaluation of bone health as well as the possibility of fracture. Initially any one imaging test conducted to evaluate the other surrounded tissue injury. Any findings need other tests for obtaining clear view. 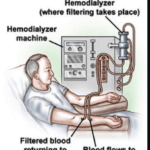 Fluid withdraw from the bursa and send it to a laboratory for culture the fluid for identification of infecting bacteria, if infection is suspected and symptoms like fever, chills and blood test indicates the possibility of infection. Massage and other physical therapies including stretching exercises specific movements are effective to reduce the pain and inflammation, even restricts future recurrence. But for this, properly skilled and experienced physical therapist is essential; otherwise wrong direction can create further complications. To relieve pain and inflammation, NSAIDs is usually prescribed by the doctors. But take as directed by a physician, as long term use or high dose can cause ulceration, bleeding or renal failure. In case of intolerable pain or severe inflammation, doctors may recommend steroids shots, but take with a doctor’s guidance, as steroidal drugs provide long term side effects. Steroidal shots are effective very fast, but pain and inflammation at the injection site is common which can reduce within a couple of days. In case of infection, antibiotics are usually prescribed to control the infection. A needle is inserted to affected bursa for collection of excess fluid which helps to reduce the swelling. This method usually conducted at the doctor’s clinic. Combination with a steroidal injection helps to reduce the pain and inflammation and after the procedure for maintaining the immobility of the knee joint; wearing a knee immobilizer for short duration recommended which can also prevent the recurrence of inflammation. If other treatments are not providing relief or frequent recurrence the condition, then doctors recommended surgical intervention for removing the affected bursa. Adequate rest and frequent postural changes help to elevate the stress in the knee joint. During sports activities specifically where continuously knee gets a direct blow like in football, wrestling wear kneecap to prevent injury. Ice compression helps to reduce the inflammation and effective for preventing further inflammation. Elevate knee after doing any activity which increases the stress in the knee joint.